Chris Mann read at Melbourne’s La Mama in the early 1970s, where he first impressed me as a bold exponent of a sort of critical, larrikin and compositional linguistics, and seemed very much at home in the theatre’s performance space, with its nascent egalitarian ethos. Some listeners I noticed may have been equally perplexed as intrigued by his well-timed delivery, his knowingly artful shtick and highly patterned patter. But I found it immediately refreshing – strangely empowering and full of a polemical vitality – as he monkeyed around with very new and homegrown language possibilities. Perhaps my mind and ears had already been primed by the 1960s ‘cut-up technique’ novels of William S Burroughs, and the more upbeat Indeterminacy, John Cage’s 1959 series of one-minute stories with electronic music. To boot, I was also half way through my first reading of James Joyce’s influential classic, Finnegan’s Wake. Astoundingly, amid Mann’s speech gestures and tics, and his relentless reflection and commentary on the nature of language itself, there were familiar echoes of the argot of C J Dennis’s The Sentimental Bloke. Mann’s work, indeed, celebrated the deepest grains of broad Australian usage, including its vernacular and slangy idioms – rhythm, pitch, intonation, everything. Mann has often observed that Australia has a long tradition of ‘making do’ – going back to the Depression, to rural scarcity, and further back to Koori culture. Having scarce resources always makes necessity the mother of invention, forcing you to find highly innovative solutions. Mann moved to New York in the 1980s, where he quickly formed alliances with other renowned composers and theorists. This milieu has proved enabling, furthering Mann’s artful elaboration of polemical tirades; fast boundary crossings between competing modes of discourse; his ever- changing writerly dynamic of assertion and refutation and of numerous ways to usefully disclose and disrupt the creeping conformity behind automatically received patterns of thought. Some Jewish scholars have observed how the Western classical tradition favours the clear arrival at a perceived unitary truth. In contrast, the Rabbinic way favours multi-voiced argument that does not rely on any one conclusion. Within this inclusive, pluralistic approach – in which minority opinions are preserved, and truth contained in contending voices – you can both argue with God and win! This alternative tradition provokes tantalising possibilities; ones emerging from previously invisible cracks between apparent truths. Hold the glass up darkly to scrutiny, and see fault lines everywhere, glimpsed most clearly in the shards, particularly those riddled by economics. One may detect, ‘the cult of repetition and the technology of agreement’. Or critique the aggressively deterministic sideshows of consumer capitalism, where market research is a sort of ‘designer theft’ and ‘user-pays surveillance’. Pieces in this book sometimes read like blips in a particle accelerator, flung into each other at lightning speed to see what deeper thought emerges among exciting cognitive flashes of collision and conjecture. Other pieces can seem more attentive to sounds rather than sense. ‘The Box’, for example, becomes as energetic as a bees’ dance, and rather than being concerned with meaning (that ‘pissy little concnpt’) they orchestrate the ubiquitous buzz of language, an endless slippage and play of phonemes into textures of vibrating sound. Walk through any mall, and see and hear. We now live in a ‘sampling world’, in which sensory overload conspires with the digital revolution, with media old and new, and with modern economics, to shape all our waking moments into a stream of micro-grabs. Reality has increasingly become a zone of cut and splice. 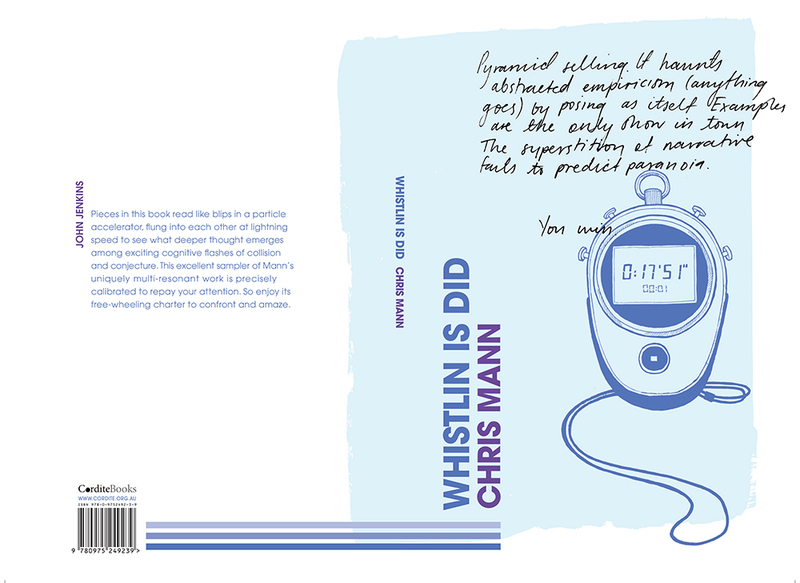 If our society is currently putting narrative through a digital mincer, then Mann, through his wonderfully idiosyncratic shorthand, helps to reveal both how and why this might be happening. All the above speculations aside, however, readers will interpret Whistling Is Did however they like. This excellent sampler of Mann’s uniquely multi-resonant work is precisely calibrated to repay your attention. So enjoy its free-wheeling charter to confront and amaze. This entry was posted in GUNCOTTON and tagged Alissa Dinallo, Chris Mann, John Jenkins, Lily Mae Martin. Bookmark the permalink.